Being a total introvert, it was through penning letters that I could interact with friends, and I had a lot of pen friends during my school days. During professional education and while having a family, I lost contact with many of them. Same thing had happened with a pen pal from Sri Lanka. During early 80’s, when my husband and I planned a trip to Sri Lanka, I tracked my pen friend down and he was happy to welcome us. Things were almost finalised when coup happened there and we had to cancel the trip. Twenty years later we planned another trip and this time also the friend was ready to show us his country. But again, the LTTE problem made us cancel for the second time. So this year (2017) when we planned the trip for the third time, I was keeping my fingers crossed till we set our feet on the soil of Sri Lanka. Unfortunately I couldn’t locate my pen friend and my husband made the whole itinerary for ten days. He had a dentist friend there who agreed to pick us up from the airport. Our flight duration was just about one and a half hours from 12.30 am. We had to leave home by 9.30 pm for the air port. After reaching Sri Lanka after 2 am, we waited at the airport till 4 am when we called our friend. So the whole night we couldn’t sleep. He took us to his house in Battaramulla and we made up our sleep during day time after a wonderful Sri Lankan breakfast that our hostess cooked for us. On the next day, on 17th September, our taxi and driver, Mr. Nuwan came at 7.30 am to pick us up. We spend ten days touring with him and found him to be a wonderful human being with abundant common sense. This was a great relief after our experience with the taxi driver during our Bhutan trip! On our way to Dambulla, we visited Muthurajawela wetlands first. "Muthurajawela" translates to "Swamp of Royal Treasure", and it is a marsh in Sri Lanka in the southern region of the Negombo lagoon, 30 km north of Colombo. The region supports 192 distinct species of flora and 209 distinct species of fauna, as well as another 102 species of birds. Some of the identified species have been shown to be indigenous to the marsh. The marsh is a major local and tourist attraction, primarily for sightseeing and boating tours. We had a boat ride for 1 ½ hours. Nuwan also accompanied us; he was good in sighting birds and animals. Apart from a number of birds, we saw monitor lizard, which was new to us. Being a spiritual healer, I use crystals for healing purpose, and rose quartz is one of my favourites. So I was excited to visit the Rose Quartz Mountain, our next destination. The Jathika Namal Uyana in Sri Lanka is the largest ironwood forest and pink quartz mountain in Asia. The row of 7 mountains is situated 180 to 300 meters above the sea level. According to archaeological research findings, the pink quartz is having a history of more than 550 millions of years. We sat atop the rose quarts mountain and meditated. What an energy it was! We took a walk into the forest, which was very rejuvenating. Namal Uyana is situated in Dry Zone area in Sri Lanka. The iron tree forest protects from the hot sunlight, giving its shade to all the small medicinal plants living in its shades and made us feel that we were in a cool area, like the coolest place in Sri Lanka. The bark of iron tree looks like rusted iron. Iron tree is the national tree of Sri Lanka. Buddhist and other religions greatly value this tree. 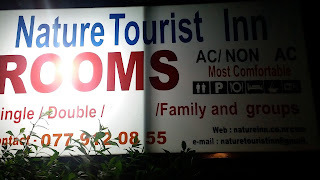 We reached Dambulla, our first stop by evening, took a room in ‘Nature Tourist Inn’ and rested for the night. 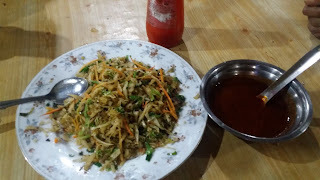 There was a small eatery nearby where went for our dinner and had kottu rotti, which is stir fried shredded roti with lots of vegetables. 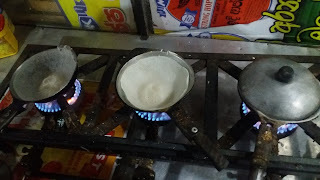 Saw plain hoppers being cooked there, which was similar to vellayappam of Kerala. 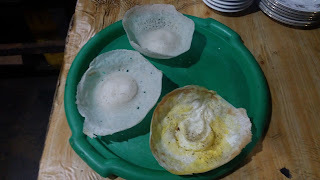 The latter we say is ‘idli with a raised skirt’, the plain hopper had the skirt raised much more! 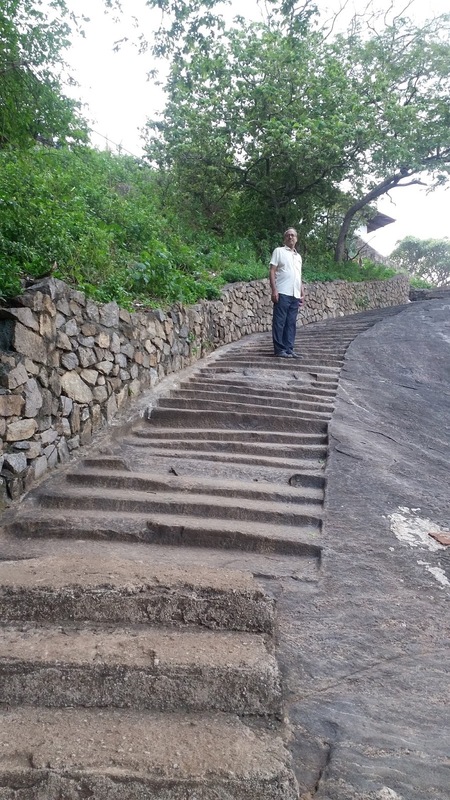 On the next day morning we got ready by 6.30 and went to the Dambulla caves, which had 200 steps to climb. We were the only ones at that time, only when we finished seeing, other visitors came. So we could absorb all that pure energy. Dambulla cave temple, also known as the Golden Temple of Dambulla is a World Heritage Site (1991) in Sri Lanka, situated in the central part of the country. Dambulla, the largest and best-preserved cave temple complex in Sri Lanka, still remains an active ritual center. The rock towers 160 m over the surrounding plains. There are more than 80 documented caves in the surrounding area. Depictions on the walls of the caves include the temptation by the demon Mara, and Buddha's first sermon. 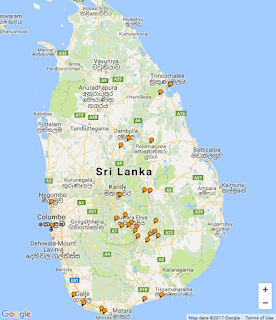 There are a total of 153 Buddha statues, three statues of Sri Lankan kings and four statues of gods and goddesses. The latter include Vishnu and the Ganesha. 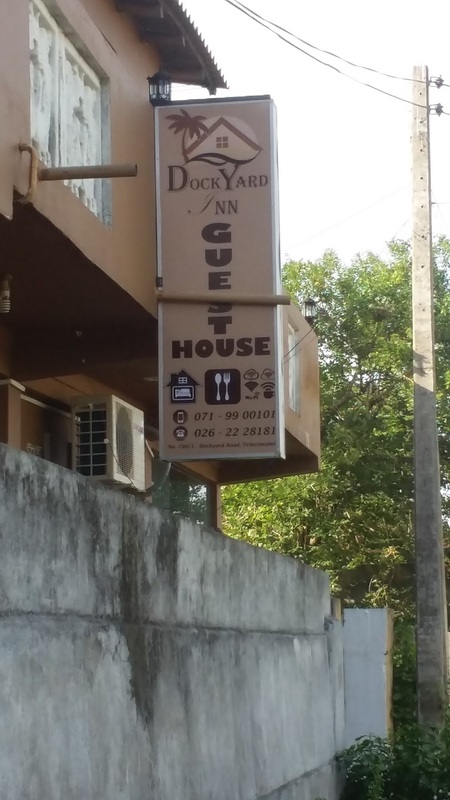 After having a nice time at the caves, we came down, had breakfast and started driving towards Trincomalee. Sigiriya was our first stop on the way. The Sigiriya Rock Fortress, or the palace in the sky is a monolithic rock which is one of the most valuable historical monuments of Sri Lanka and the locals refer to it as the Eighth Wonder of the World. Sigiriya, also known as the “Lion Rock”, is 200 meters higher than the surrounding jungles and a popular tourist attraction. The name “Lion Rock” comes from the enormous lion which greets visitors halfway up the rock on a small plateau. Extensive network of gardens and reservoirs surround this rock fortress and palace ruin. The gardens of Sigiriya are among the oldest landscaped gardens in the world. 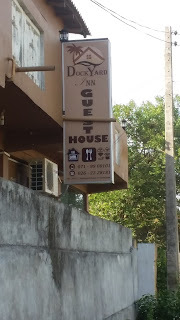 We reached Trincomalee by lunch time, took a room in ‘Dockyard inn’ and took a nap. Then we set out to visit Fort Frederick, Koneshwaram temple, Hoods Tower museum, and Nilaveli beach. Fort Frederick has been a defensively important site for centuries. It occupies the neck of a narrow peninsula. A fortress was initially constructed here by the Portuguese in 1623, later rebuilt by the Dutch,and the British took over in 1782. 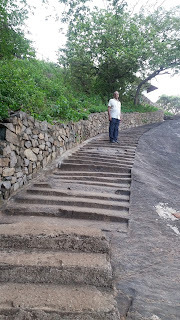 It is used today by the Sri Lankan military and we could take a leisurely walk around. Assorted cannons, artillery and huge banyan trees were seen. Koneshwaram temple sits atop the Swami Rock, on the Gokarna Bay, which is a seasonal home for blue whales. 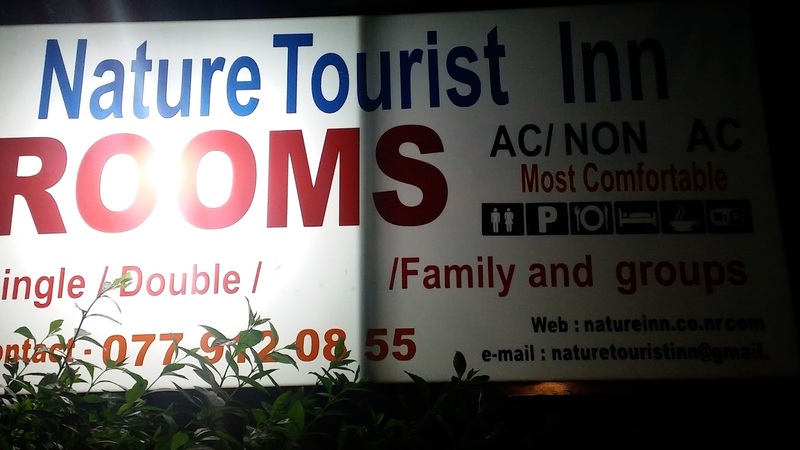 It is a religious pilgrim center, where people come to pray for getting children. Once they are blessed with a child, they come back and put a wooden cradle in the temple compound. We reached there at 4 pm, when the puja started. We were happy to attend the puja. The original temple is claimed to have been the greatest building of its age, for both its architecture and its ornamentation. The grandeur was mostly lost in the 17th century, when the Portuguese razed structures, dumped some into the sea, destroyed objects, and smashed ornamentation. To salvage what they could, priests and devotees of the temple buried their sacred objects, even taking advantage of the sea themselves rather than seeing them crushed in the raid. The Hoods Tower Naval Museum is located in the Trincomalee peninsular on a high ridge overlooking the entrance to the inner harbor of Trincomalee within the Sri Lanka Navy Dockyard. The Museum gains its name from the Hoods Tower, an observation tower named after Vice-Admiral Sir Samuel Hood, Commander of the East Indies Station. The museum presents the remarkable history of Sri Lanka Navy up to the defeat of the LTTE terrorists. Nilaveli Beach is one of the finest beaches in Sri Lanka, perhaps in Asia. Walking along the long and wide beach with the brilliant white sand was a great experience. Dolphin watching was fixed for the next day, when we took an early morning boat ride. Trincomalee has been recognized as a great spot for whale and dolphin watching, and our amazing experience confirmed it. We saw more than fifty dolphins, riding along our boat and dancing around. Kanniya hotsprings was our destination after breakfast. There were seven square shaped wells, about 4 feet deep, with clear water. Buckets were provided, to draw the water and pour over ourselves. It felt so good after the bath. It is believed that bathing in this hot water would cure arthritis, rheumatic pain and skin disease. According to the locals, Kanniya hot water spring is dated back to the Ravana era and the first written references to a hot water spring near to Gokarna bay (Trincomalee) is said to be found in the epic Ramayana. 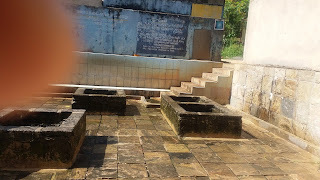 Religious Hindu rituals dedicated to lost loved ones are observed by the Sri Lankan Tamils at this site, believed in folklore to have been started by Ravana. Ravana and his mother worshipped God Shiva at the Koneswaram temple. Marble beach , our next destination, also known as Marble Bay Beach, is another fine beach in Sri Lanka. The day was bright and the sea calm, we could see the surface shining like a marble, the reason for its name. We spent an hour standing in the clear water, watching schools of colourful fish passing by. We started early morning the next day to Kandy and stopped at Polonnaruwa. The ancient city of Polonnaruwa remains one of the best planned archaeological relic cities in the country, standing testimony to the discipline and greatness of the Kingdom's first rulers. It is the second largest city in North Central Province, and is known as one of the cleanest and more beautiful cities in the country. The green environment, amazing ancient constructions, and Parakrama Samudra , are major tourist attractions. Parakrama Samudra was created by King Parakramabahu, and it is the largest man-made rainwater reservoir in the country, spanning an area of 2,500 ha and remains a primary source of water for agriculture in the district. Then we visited the palace of King Parakramabahu in Polonnaruwa, which must have been an imposing edifice once, richly decorated and seven storeys high. This Royal Citadel has many interesting monuments. The remaining walls of the palace are of extra-ordinary thickness and the drainage system is intriguing. There is a beautiful Royal Audience Hall – embellished with lion portals, graceful pillars and a moonstone, which is a delicately carved stepping stone. Located among the ruins of Polonnaruwa, there are several ponds. Among them, Lotus pond (Nelum Pokuna) is unique because its shape, which is similar to the shape of a bloomed Lotus flower. It is made out of granite and has five levels from bottom to top.